Aging: Aging on the lees in used barriques and final assembly in large Slavonian oak or steel barrels. Match with: Ideal for grilled red meat, especially with lamb. Serving Temperature: Temperature 16°-18 °C. Calabretta Cappuccio Sicilia IGT 2011 comes from Nerello Cappuccio grapes grown in Contrada Calderara in Randazzo (700/750 s.l.m), on the slopes of Etna, from 0.30 hectares of vineyard resting on volcanic soils, rich in sand mixed with stones. The sandy soils with a lot of "ripiddu" and covered by a bed of stones, give us an elegant wine, of good structure and extremely long-lived. Cappuccio Sicilia IGT 2011 di Calabretta comes from Nerello Cappuccio grapes grown in Contrada Calderara in Randazzo (700/750 s.l.m), on the slopes of Etna, from 0.30 hectares of vineyard resting on volcanic soils, rich in sand mixed with stones. In the vineyard the organic farming regime is in force, the plants are planted with espalier saplings and the planting density is about 6250 plants per hectare. The total yield is only 25 Hl per hectare. Vinification involves destemming, the following crushing and a 5-day maceration; the beginning of alcoholic fermentation is activated by natural yeasts in steel containers. The end of alcoholic fermentation and the following malolactic fermentation take place in used barriques, assembling takes place in large barrels and steel. Wine with excellent capacity for evolution. Taste it at a temperature of 18 ° C, on red meats. 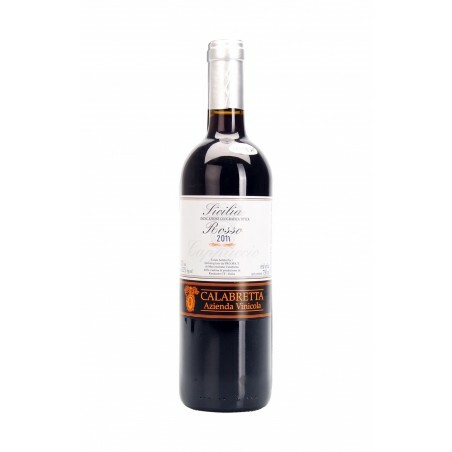 Description: Calabretta Cappuccio Sicilia IGT 2011 comes from Nerello Cappuccio grapes grown in Contrada Calderara in Randazzo (700/750 s.l.m), on the slopes of Etna, from 0.30 hectares of vineyard resting on volcanic soils, rich in sand mixed with stones. The sandy soils with a lot of "ripiddu" and covered by a bed of stones, give us an elegant wine, of good structure and extremely long-lived.